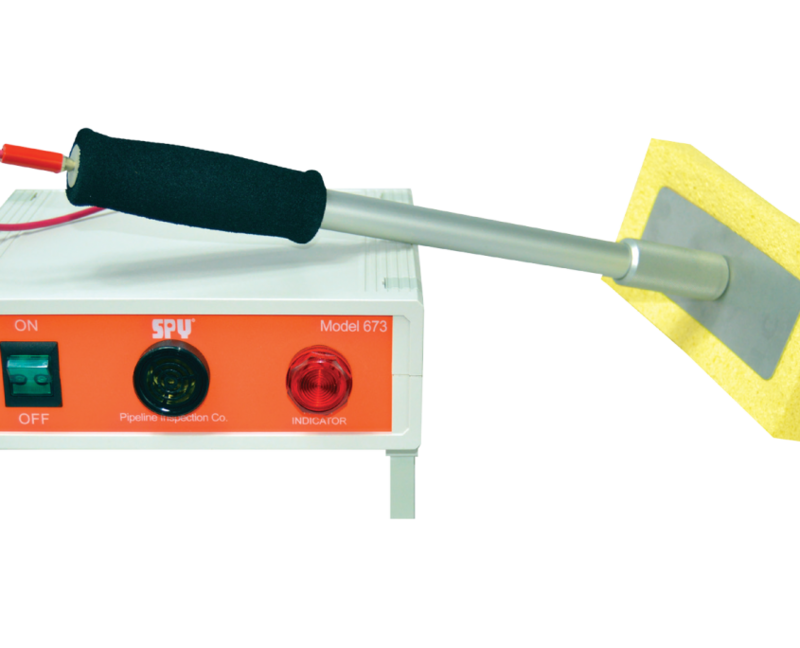 The Model 673 Wet Sponge Holiday Detector for Plant or Stationary Operations is highly sensitive and accurate. A uniform coating of only one mil of paint or other non-conductive material over a metal surface is sufficient to repel a small current flow. If a pin-hole holiday is encountered, moisture from the sponge will seep into the hole and create a free path for electrical flow, activating the signal horn. For coatings 1 to 10 mils thick, ordinary tap water can be used to wet the sponge. For coatings of 11 to 20 mils thickness, a non-sudsing wetting agent (such as Kodak Photo-flow R®) is recommended to increase ability of the moisture to swiftly make its way through the pin-holes. Convenient output plugs on rear of unit allow use of customer supplied external signal systems such as lamps, Klaxon horns, recorders, etc. Output from these plugs is 120 volt A.C.